I have 2 tattoos with plans of getting more, one of which is my mother's signature. The problem with that, I have nothing with her signature on it. I have searched all of my school papers from before she passed away, asked family members if they have cards she may have signed from years past, anything at all but i have always come up short. 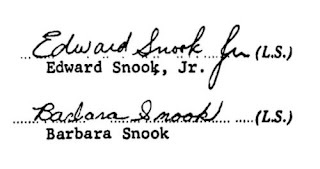 Last night I fell down the genealogy rabbit hole, land deeds. I found a search full of deeds, mortgages etc from my hometown. It started with a simple Google search of my ancestor, Samuel Rysdyk, that led to property he once owned, which then led to the original search database. I entered my maiden name thinking I may be able to see deeds for the old family farm (I did! more on that later!) but I also found the deed and mortgage to my parents first house that they bought when the were married back in 1972! after going through a few files I found it! I seriously could not believe what I was seeing. My mother's signature was right in front of my eyes! I had to save it to my computer as fast as I could because I felt like if I didn't, it may disappear. I can't wait until I have the time (and figure out the location) to get the tattoo that I've been wanting to get. Of course I couldn't stop looking at the land deeds after I found this. There was a wealth of information right there at my finger tips. I stayed up much later than I should have and still haven't touched 1/2 the information. I have so much to do and no time to do it! I will posting more of my findings however once I have it organized. I couldn't leave without posting this as well. 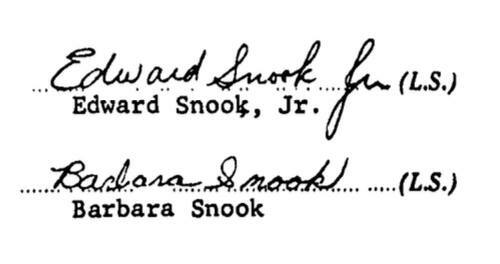 It's the signatures of my grandparents (one I've never met) and my great grandparents (both deceased before I was born).